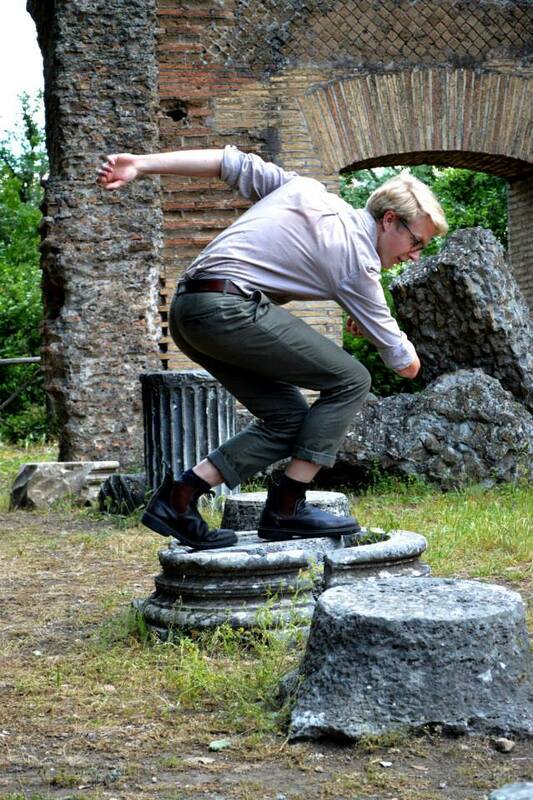 Andrei Mihailiuk is a 2nd year MA student at UBC and for his digital humanities project this spring, he created an interactive map of the theorized routes of the Roman Triumphal Procession. Take it away, Andrei. As always, let’s start with a brief description of your project. 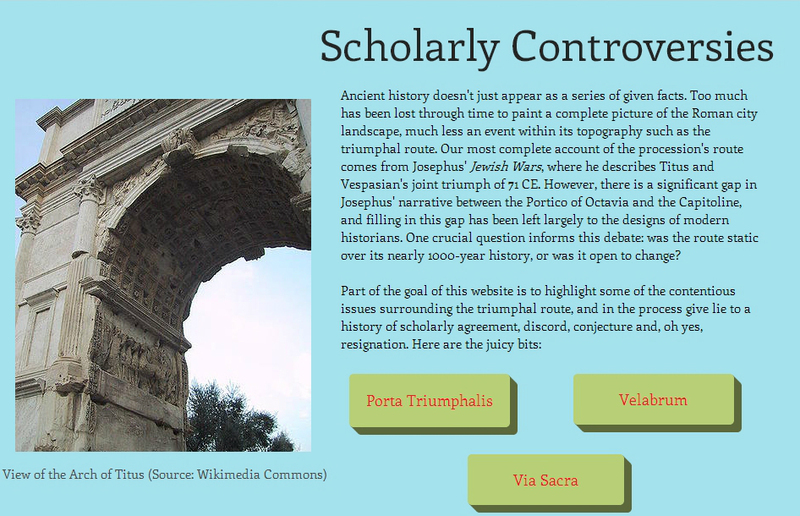 My project is a database-in-progress recording the ancient literary references, archaeological traces and modern scholarly reconstructions of the Roman triumphal procession. 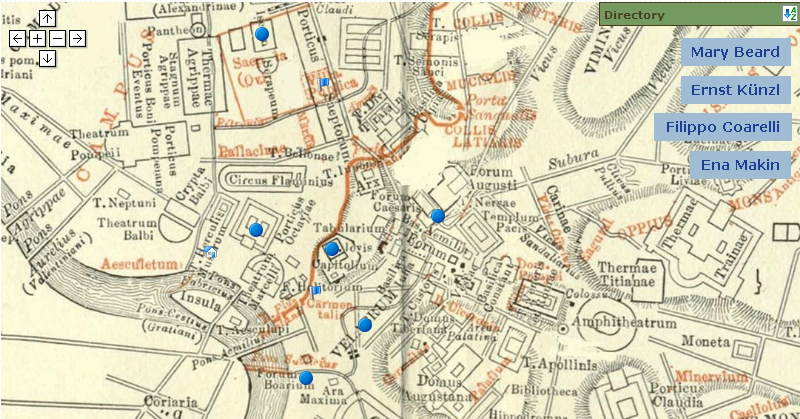 The website takes the form of an interactive map of ancient Rome, derived from Platner and Ashby’s now-public domain Topographical Dictionary of Ancient Rome (1929), which allows users to compare the evidence with the various reconstructions. What lead you to this particular topic? Did you have a prior interest in the subject or did you choose the topic based on what could best be presented digitally? I knew from the get-go that I wanted to create some sort of digital map for my project. As for the subject, I was initially attracted to the Roman triumph after reading Diane Favro’s fantastic article “The Street Triumphant”, which discusses the ways in which wealthy Roman patrons implicated themselves with Rome’s military narrative through their building projects along the triumphal route. One problem, alluded to in the article, is that the route of the procession is hazy, broken and contested. In the end, I used the site hosting server Wix, and an interactive mapping program called MapsAlive. While I had some rudimentary previous experience with site hosting servers using WordPress, I had never used either of these programs before. Perhaps the most challenging part of the project was cementing what exactly I wanted to do, and finding the corresponding toolset through which to accomplish it. My initial plans for the project were far more abstract, and were something to the effect of creating a map that conveyed the geographical and chronological expanse that the Roman triumphal procession condensed and narrativized in its route. This required a toolset that would allow not just hotspots with popup information, but the ability to zoom out and in over incredible resolutions. Simply put, such a program did not exist in my budget range. As my goals became far more modest – and arguably more fruitful – I finally came upon a program that could display exactly the information I wanted to display. The limitations of your presentation medium in effect become the limitations of your project. Now that I have a basic knowledge of coding, and a deep understanding of this particular mapping program, I would absolutely undertake similar mapping projects, though perhaps with different research goals – just to see what other data can be effectively displayed in this medium. I most certainly intend to maintain my website, and have even taken steps towards communicating with other scholars who have done work on the triumphal procession. Currently I feel that the archaeological aspects of this topic are underrepresented, and so I want more input from Roman urban archaeologists in particular. Given that the top-down perspective of visualizing space has been favoured by humankind for thousands of years, I am confident that my two-dimensional map is an effective first step in highlighting some of scholarly problems surrounding the triumphal route. The ability to see how scant the evidence of the route is in direct comparison with the leaps in logic that scholars take in order to fill in the gaps, I feel, should incite a more careful and critical look at how we reconstruct the past, and should even bring the most fruitful methodologies to light.